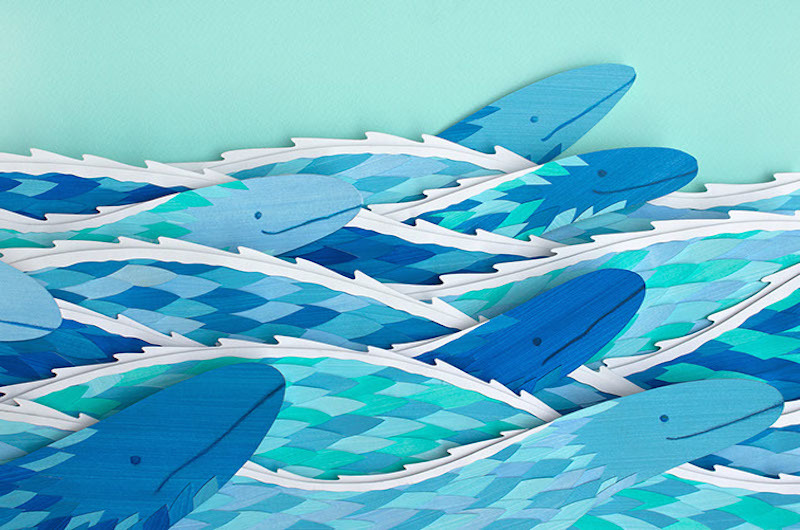 Taylor Stone's medium is paper and her art mesmerizes. 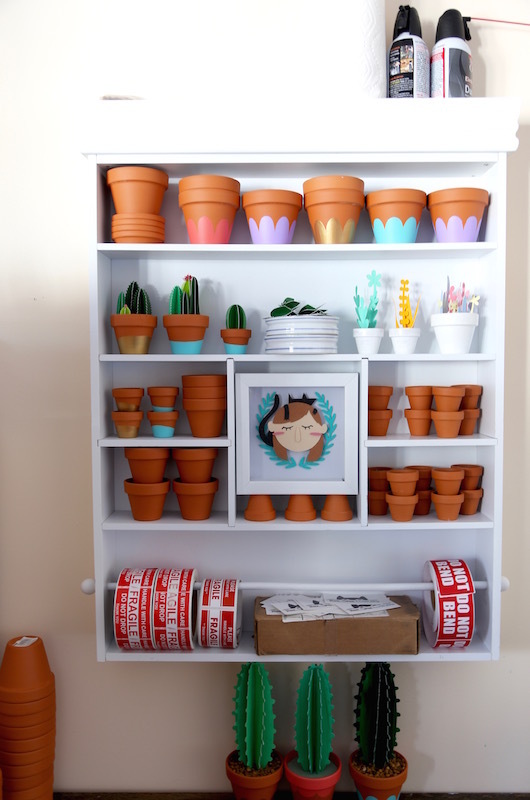 Taylor Stone was living in Burlington, Vt., wishing she had some plants to liven up her space. Unfortunately, Ms. Stone has the opposite of a green thumb. Any plant under her care seems to wilt. What she needed was a hardy plant that could withstand even her misguided care ­­­— a plant that needed no watering, no sunlight and yet still would be brightly colored. So she made her own, out of paper. Ms. Stone, 25, has always been drawn to paper. As a child growing up on the Vineyard, she hoarded scraps of it. “I’ve always loved it, but never knew what to do with it,” she said. At first she experimented with origami, delicately folding squares into cranes. But it wasn’t until her junior year of college at the Savannah College of Art and Design that she began to focus on paper as a medium for her art. Prior to this, Ms. Stone had been doing wood block prints, but she worried that once she graduated and had no access to the equipment needed for block printing, this wouldn’t feasible. 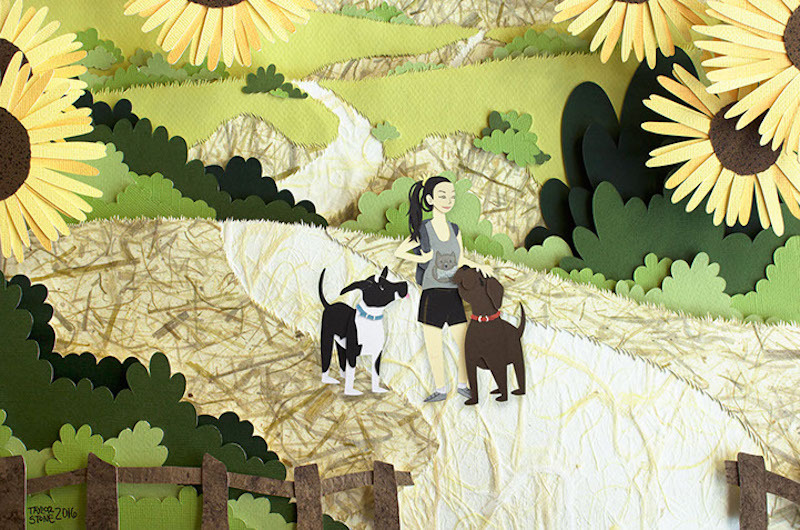 So she began building detailed pictures out of layers of cut paper. It turned out cut paper illustration wasn’t all that different from wood block printing. The process begins with the design, which she draws on her computer. The design is then printed on carbon paper and traced over to colored paper, which she often creates too. “It’s like a paint by numbers but I’m the one who designed it,” she said, describing the process. Almost everything is hand cut with an x-acto knife. Ms. Stone prefers to cut every piece of an illustration out before she begins to assemble it. However, it can be difficult to keep track of every tiny flower, star or window pane. As she glues the pieces together, she creates real and perceived depth in the design. She often depicts nature in her illustrations, something she’s been drawn to since childhood — from an arboreal tunnel to a cave of crystals to a whale’s tail slipping below the ocean surface. “I was one of those people who believed in fairies longer than I should have,” she said. It’s no surprise she counts film director Hayao Miyazaki among her inspirations. His animated films often have strong environmental themes. The lush greens in many of her pieces would not be out of place as a background in a Miyazaki film. “I think his movies capture the magic in a way that adults can still appreciate, which is kind of like what I do,” she said. After college, Ms. Stone spent two years working at a UPS store, and learned to frame at a Michael’s craft store. She moved back to the Vineyard when she was accepted into the artisans festival. Her mother, Lori Stone, is a fiber artist and was a part of the artisans festival back in its early days. Her father, Bruce Stone, is the town accountant for West Tisbury. Taylor Stone said her parents were the best combination for an aspiring artist, cultivating both her creativity and her business acumen. Her family moved to the Vineyard after she finished fourth grade, but had visited the Island every weekend and holiday before that. “I went to church since I was very, very, very little in Edgartown,” she said. Ms. Stone’s day job is at EduComp, but her commission calendar has been filling up. She’s duplicated the beloved pink house in the Camp Ground in paper, a fanciful interpretation of the sea as serpents and the view of her favorite beach (Lambert’s Cove) all out of carefully painted and precisely cut paper. The Vineyard audience has responded well to her designs, as likely to embrace a cut paper illustration of Lambert’s Cove as they are a print. Ms. Stone relishes in the shadow boxes she calls show-stoppers. If not huge in size, they are immense in detail. 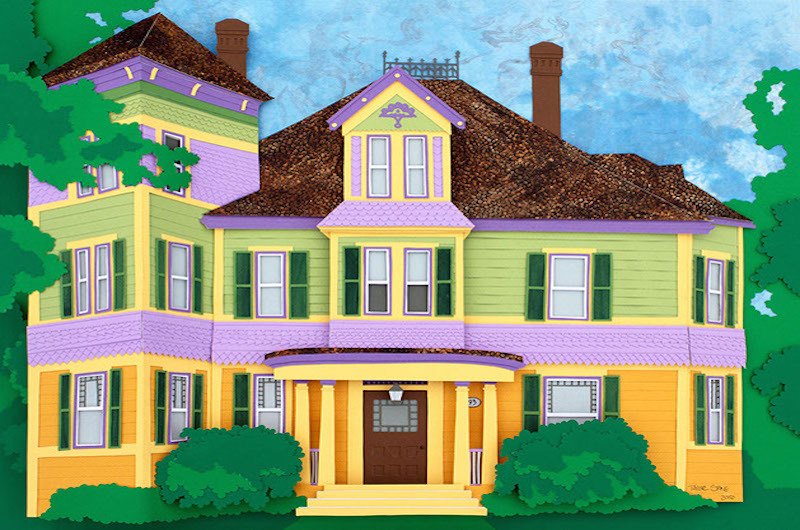 She recently completed a 20x24 inch shadow box of an elaborate Newton home for a client. It was the biggest piece she has ever done. To see more of Taylor Stones work visit taylorstoneillustration.com.